In short, I did and it was great (no, really). A wonderful thing happened to me – I fell off my bike for the first time ever. Let me explain. You’ve heard that people learn by making mistakes. But there’s another brilliant saying that mistakes should be “painful non-catastrophic failures”. This is the best way to learn. I would definitely label my wipe out as painful but non-catastrophic. Oh, and yes, it was a failure. It was 4 degrees Celsius after a few frigid weeks here in Toronto so it felt relatively warm. The catch was that there was some snow and ice on the ground. 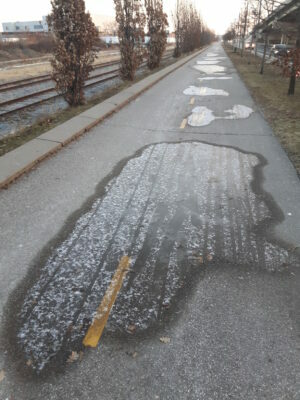 The paths I rode on were generally pretty clear as the city does a good job of salting them. However, the less frequented areas had some ice patches. I thought it would be fun dodging them. I do love a good obstacle course. I hadn’t ridden a bike for about a month but it felt longer than that. I had been watching some tough cookies ride through snow, slush, and ice, and I was itching for a day with reasonable riding weather. When I first started peddling I thought, “this is awesome, and I’m awesome”. I missed biking even more than I thought! I felt great cruising along a curvy path dodging patches of ice. I knew to slow down around the bends and be careful but evidently I wasn’t careful enough. The ice patch that took me down covered the entire width of the path for several metres so there was no escaping. This wasn’t ice that was beautifully Zamboni’ed (ya I verbed it). It was snow that was trampled on, then rained on, froze, melted, refroze, and so on. The result was wet bumpy ice that twisted my front tire left and right just before I flew off. Okay, there was no flying, just pathetic falling. Then I started to feel parts of my legs throb. “Damn, this hurts”, I thought. Living a cozy adult life, I don’t get nicks and bruises often. So I was being a bit of a baby. It took me a few seconds to gather myself (cursing silently). I pictured where the bruises were on my legs as I peddled on. I went from pouting to glowing pretty quickly though. You see, it was a “painful non-catastrophic failure” – just what I needed. Thank you bicycle Gods! I wasn’t seriously hurt, I didn’t hurt anyone else, and most importantly, I didn’t hurt my kids. If I was riding my kids to school, I wouldn’t have forgiven myself. Not to mention the guilt of bribing my kids with sweets to not tell mom would have ate away at me. So I had a little spill, no biggie. It was actually wonderful. People always tell me to “be careful”, “ride safely”, or something to that effect. Experiencing the fall firsthand was just what I needed. I’m going to be extra careful now when the conditions are less than perfect.